MOUNTAIN VIEW, Calif. -- Watch out, Facebook. There’s a new rival to your Messenger app. During the opening day keynote Wednesday at Google I/O, the company’s 10th annual developer conference, Google announced two new communications apps. Google’s Allo is a new chat app that uses artificial intelligence to learn how users like to communicate and express themselves. The app is set to be released on both Android and Apple's iOS this summer. Allo has a feature that will let users be more secretive about some of their conversations. With the Incognito Chat, user can send anonymous messages and also have those chat conversations automatically disappear once the user is done. Google also announced Duo, a video chat app also to be released this summer. Much like its smart chat counterpart, Duo is designed to let users video chat with each other. What sets Duo apart is a feature called KnockKnock, which enables users to see a live stream of who is calling, as well as what they’re doing. Want to talk to your friend who is showing off her new engagement ring? Take the video call. Want to avoid talking to your girlfriend who is looking pretty angry right now? Maybe you want to skip that one. While KnockKnock and Incognito Chats are new features, what Google says will set its new communications apps apart from rivals like Facebook Messenger is that the apps have Google Assistant built into them. Google Assistant, which was also announced at I/O, is A.I.-based software designed to let users not only conduct voice searches but also control and manage their music, videos and home devices. Inside Allo, for instance, Google Assistant will suggest emojis to go with chat conversations. Chatting about a favorite sports team? Allo will pull up team stats, let the user know when the team’s next game will be or provide information on popular players. 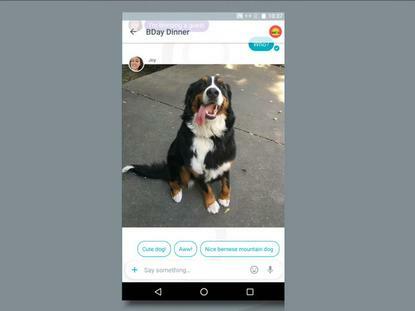 With a smart messaging app, if a friend sends a photo of a new puppy, Allo will offer several possible replies, like "Cute puppy!" or "Nice border collie!" Google I/O is being held for the first time in Mountain View, where the company is headquartered, and continues through Friday.